Thinking about a laser eye operation? Find out the gory details whether it's for vision correction or a medical reason like a cataract problem. If you're contemplating a LASIK eye surgery, you probably want to know what it really entails, what the risks are and, most importantly, will it hurt? While I'm not EVER going to subject myself to LASIK surgery for the purposes of vision correction, it's possible that one day, I may need a laser eye operation to cure an eyesight problem, the most common being a cataract, where the lens becomes cloudy, preventing celar vision. My mum recently had a cataract operation and I researched the topic carefully, just to prepare myself, in case I ever need the same op! A cataract operation is quite similar to laser surgery for vision correction; the difference is in the time it takes, as with a cataract op, a permanent contact lens is inserted underneath the corneal flap that is cut and lifted, just as it is to perfect someone's vision. 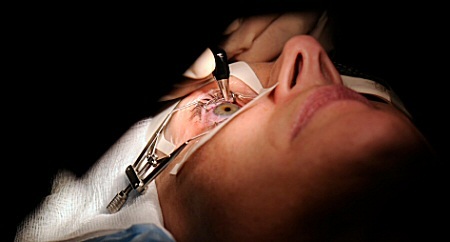 The above picture shows a LASIK surgery procedure to correct someone's vision. LASIK, which stands for Laser-Assisted In Situ Keratomileusis, is the modern method for cosmetic eye laser surgery, cosmetic, in the sense that it is an elective operation, chosen by the client because they no longer wish to wear either glasses or contact lenses. FACT: Did you know that military personnel with eyesight problems in the US army are FORCED to have laser eye surgery as contact lenses are not allowed to be worn in military combat situations? A laser eye operation either for vision correction or medical reasons is pretty commonplace these days and technological advances are such that there is now very little risk of complication - only around 1% of patients suffer any problems after surgery and most of those can be sorted by either an additional "enhancement" laser eye surgery or by medication. Well the eye is numbed before the procedure, so most surgeons would say no it doesn't, although it looks pretty uncomfortable having your eye held open in a clamp, and you may experience pain afterwards. The smell of your cornea "burning" when the laser gets to work is pretty off-putting too, from what I've read, but then, as you probably know by now, I'm never going to have this type of surgery by choice! There is apparently very little risk of being blinded, unless you use a truly awful eye surgeon, so the main risks are probably severe dry eyes after the op and possible night vision problems like double vision. So how much does LASIK eye surgery cost? ...then the more you will pay, plus cost will depend on which version of LASIK you choose, for example the bladeless (using a separate laser to cut the corneal flap) or bladed option, which uses an instrument called a microkeratome to cut a flap in the cornea. There is an excellent guide on laser eye surgery costs at All About Vision, where you can expect to pay around $1500 to $2000 per eye. Me I just add up the number of disposable contacts and solutions I could buy with all that money - a good way to avoid a laser eye operation!